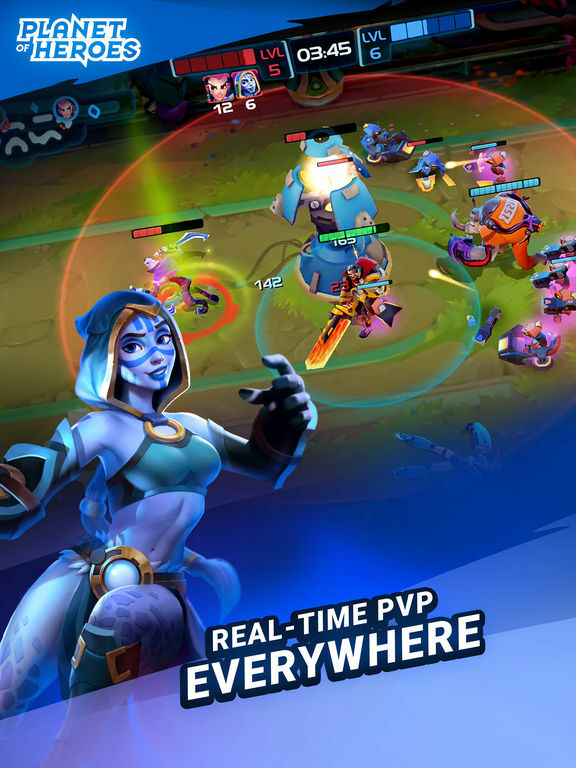 Planet of Heroes pretty much tosses you into the deep end right from the start - straight into PvP, with Practice mode becoming available later. Fortunately it's not too terribly difficult to grasp, even if you don't have any previous MOBA experience. There are a lot of different heroes, and they all have their own quirks. Melee-centric heroes are pretty straightforward. They tend to be the most durable, deal a decent amount of damage, and perform best when they're right up in the enemy's face. Ranged heroes are, of course, better when used at a distance. They can't absorb a whole lot of damage but they can deal it out pretty well. Support heroes aren't as durable as melee classes or as hard-hitting as ranged ones, but they make up for it with skills that can assist the entire team. They're the trickiest class to use, but can also be the biggest boon in a match when used well. Remember who you are. If you're a durable melee hero, try to stay in front of any ranged or support heroes on your team. If you're a ranged hero, stick close to your sturdier teammates and back them up as needed. It's all fairly intuitive stuff, really. Every hero has an overall speciality, but you can fine-tune their performance to better suit your preferred play style. Skins are mechanically pointless. They're purely cosmetic, so don't spend the premium currency on them expecting any sort of in-game benefits aside from looking cool. Runes are important. Runes provide passive buffs and abilities depending on the hero. Make sure you know what you have equipped before a match so that you can take advantage. You can also buy more runes from the Hero menu. Equipment can be upgraded to grant permanent stat boosts. It requires lots of different materials, and you won't be able to do it right away, but it's worth looking into once you really start to get your feet wet. 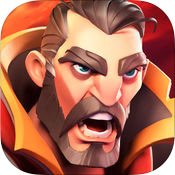 Ultimately, Planet of Heroes is a pretty straightforward affair that works as a good jumping off point for those looking to get their foot in the MOBA door. Being unceremoniously tossed into PvP from the jump kinda stinks, but it all evens out after that and what we're left with is an entertaining and accessible (and portable) addition to the popular genre. Truth be told, it was a surprise to find out that Planet of Heroes was a MOBA (Multiplayer Online Battle Arena - think LoL or DotA). Mostly because I just gave the App Store screen shots a cursory glance before downloading, and didn't bother reading the description. But yeah, it's definitely a MOBA. Fortunately it's one that doesn't demand an absurd amount of commitment or knowledge from players. For the most part. I know I just alluded to Planet of Heroes being accessible, and I still believe it is for the most part, but oh my gosh does it have a rough start. The first thing - the very first thing - it has new players do is jump into a PvP battle. No explanation of the characters or the gameplay or even the controls. It's just 'Hi there! Here's a hero and now you're fighting other players! Don't let your team down.' Words cannot adequately describe how much this irritates me. Worst of all, there's a Practice mode that would have been a much better place to start. After that ridiculousness the game does ease up a bit. It's actually more accommodating to MOBA initiates than I'd expected as it strips most of the micromanagement out of the matches. 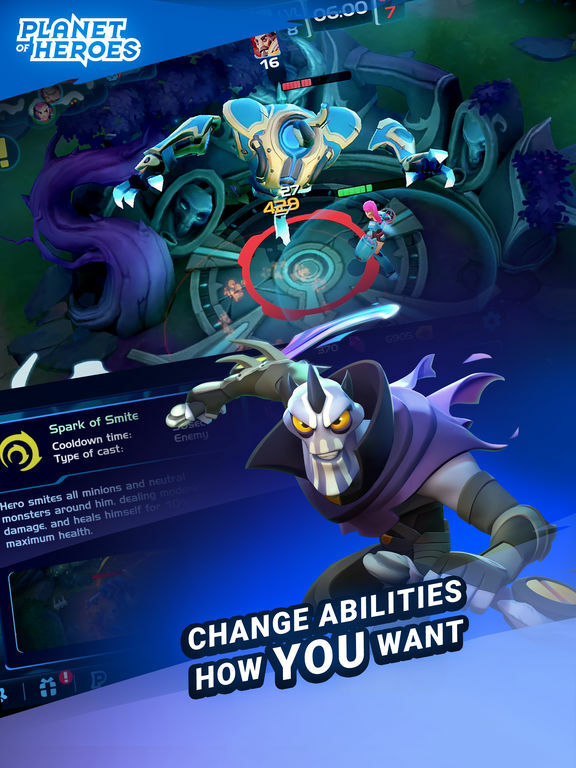 Unlike the average MOBA, where players gain experience and earn money during a match that will go towards improving and upgrading their character for that match, here most of the upgrades are permanent and take place outside of matches. In other words you don't have to worry about frantically deciding how to tweak your hero while the rival team is bearing down on you. This isn't to say that character development makes things unfair for others, though. Most of the tweaks deal with shifts in abilities (i.e. focusing on attack instead of defense) rather than boosting stats - although minor stat boosts are also possible by way up upgrading equipment. Again, I really wish Practice mode was available from the start, because in addition to providing a stress-free way to experiment with your chosen hero it also lets you try out all of them. Whether they've been unlocked or not you can create a team of any three heroes you want and try them all out. This is great as it gives players a chance to get a feel for anyone they might want to purchase with premium currency before they buy, and it's a good way to test out which hero types compliment each other best. Planet of Heroes also looks great. The visuals are bright and colorful, while the heroes themselves are quite varied in their designs. It's kind of par for the course for MOBAs, honestly, but I still very much appreciate the drastic visual differences between each character. Doubly so for the various hero skins that do nothing but give a specific hero a new look. I do have one other complaint aside from the careless way players are dropped into PvP, though: the auto-targeting. At first it seemed great because I could just hold down the attack button and my hero would automatically zero in on and move to the closest enemy. They even prioritize rival heroes over minions. However, this can be more of a problem when there are several heroes on screen at the same time. On more than one occasion my hero stopped attacking a rival who was almost done for and instead went after someone with full health. That's kinda stupid. Along with that irritation is the way the auto-targeting seems to hate targeting enemy structures and will favor just about anything else. Because it's not like you need to destroy them to actually win or anything, right? Manual targeting (by tapping on a thing) helps a bit, but in the heat of battle it's kind of awkward to do. Especially if there's a tight group of enemies and you want to target something more specific. Planet of Heroes deserves credit for giving players who might not be familiar with MOBAs a good place to start - minus the absurd thing where it drops them into a PvP match first thing, of course. It cuts out some of the micromanagement stuff, which might put off more avid MOBA-ers, but makes up for that with out-of-match character customizations. If you're not into this stuff already I don't think you're going to be swayed, but if you've been curious to try the genre out (or are looking for a simpler portable option) then it's worth a look.